OER are teaching, learning and research materials licensed to permit no-cost access, re-use, adaptation and redistribution. Faculty may use these learning resources in their classrooms as they would use a traditional textbook, or they may modify or adapt them to fit the specific pedagogical needs of their course. The “5 R’s” of OER include the ability to retain, reuse, revise, remix, and redistribute the content. Textbook costs have risen 88% since 2006. One study found 65% of students opt out of purchasing textbooks. 48% of students said the cost of textbooks impacted how many and which classes they took each semester. In addition to addressing high textbook costs and day-one access to course materials for all students, a recent large-scale study at the University of Georgia has shown that OER leads to significantly better academic results for students. Student success contributes to student retention. Another recent study reports higher retention in a course when an open textbook was used compared to a previous semester for the same course when a commercial textbook was used. OER can even support innovative teaching practices. Learn more about the significant benefits of OER for students and faculty. OER@UMT wants to bring more free educational resources to our classrooms and we want you to join us. Receive an incentive to review an existing open textbook. This is a great first step for faculty with little experience researching OER. Learn more about the OER landscape in your discipline! Faculty are encouraged to complete this grant before applying for an Adopt, Adapt, Create Grant. Read full application directions. Replace your current course textbook with OER that you either find, adapt, or create from scratch. Read full application directions. Amount: $500 to adopt or $1,000 to adapt an existing open educational resource or $2,500 to create an open educational resource. Download the OER workshop slides and watch the OER workshop recording from the OER workshop that was held February 6, 2019 from 2:00-3:00 pm in the Mansfield Library's Student Learning Center. Workshop presenters Wendy Walker and Nancy Clouse provided information about OER and about applying for funding through OER@UMT. On February 26, 2019 from 2:00-3:00 pm in Todd 210, instructors Jo Costello and Marlene Zentz presented Open Educational Resources (OER): Checking for Accessibility. This session covered basic accessibility principles to consider when reviewing and choosing OER and provided an OER Accessibility Checklist. OER@UMT brochure #1 describes the OER@UMT Grant Initiative and how it helps reduce costs for students and supports student success at UM. OER@UMT brochure #2 describes the OER@UMT Grant Initiative and how OER can enable innovative teaching practices that result in improved student learning and engagement. 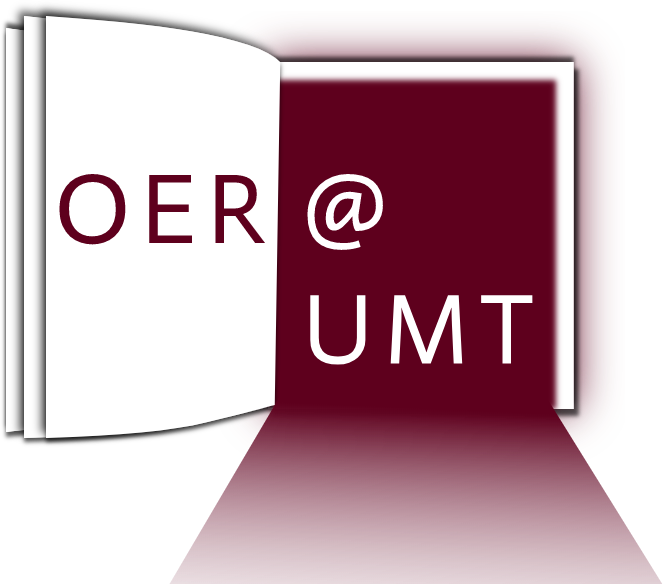 OER: Supporting Student Success presentation: This brief presentation describes OER, the OER@UMT Grant Initiative, and how OER can enhance both the learning and teaching experience towards the goal of supporting student success and retention. Originally presented at the FDO session on student retention on January 23, 2019.